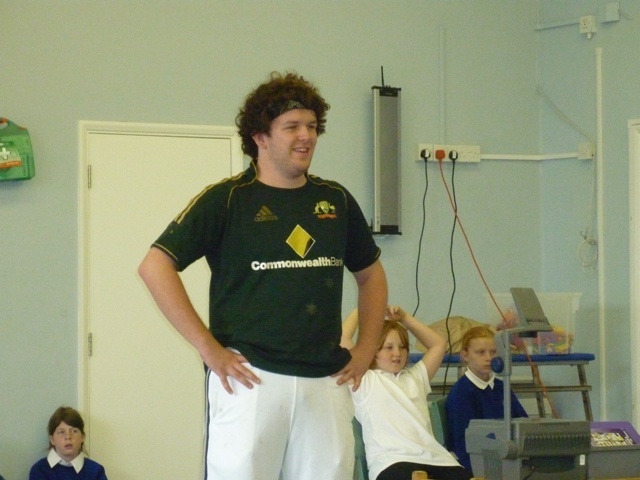 Earlier this month, Travis came to Holbrook to visit Years Five and Six. In the morning he taught Zephaniah and Brunel classes Aussie Rules football, a popular game in Australia which Travis plays in his own city Adelaide. He taught us some basic skills like throwing, catching and kicking the ball. To throw the ball you have to hold it in the palm of your hand and punch it with the side of your fist. We also played a game in the hall to practise our throwing skills. In Travis’s home city, Adelaide, there is an amazing zoo with pandas, lions and cows (!) Adelaide is the capital of South Australia and the population is around one million. Travis joined Brunel and Zephaniah for Australia afternoon. The two classes had about ten different activities they could choose. Some of the activities included playing games on the laptop, tasting vegemite on toast and finding out Australian facts.